This entry was posted in book proposals, entrepreneurial writing, fiction writing, publishing, queries, writing conferences and tagged free 2012 Guide to Literary Agents, free book, GLA, literary agents. Bookmark the permalink. Good luck, and thanks for a lot of good writing posts on Google +. I just recently subscribed to your posts and have really been enjoying them. And I’m not just saying that because that book giveaway looks pretty awesome. Thanks for the chance! 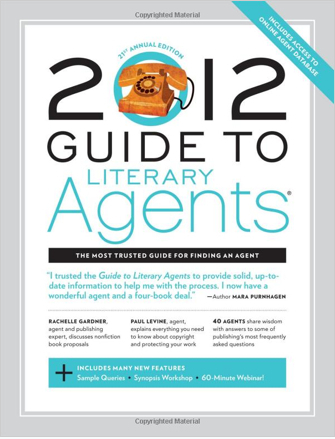 I always kind of wanted to have an agent provacateur, but I suppose a literary agent would be almost as cool. And thanks for saying I’m pretty. Hey Kim, flattery will get you nowhere in this contest. (Though I think you should continue trying that angle.) Really though, that’s exceedingly nice of you—thanks! Rick, I’m sure in the world of agentry, there is a candidate that has the requisite trench coat, dark glasses and sidelong glances of any stalwart spy. You can do all your communications with the decoder ring you got out of the Cheerios box in the late 70s. As for pretty, oh yeah. Nabbed the bit that sounded most interesting already. Thanks for that retreat freebie! Oh, and I concur, Rick is very pretty. But of course, Dorothy—pretty is as pretty does, to put some Gumpian goulash on it. And we all do need writer’s retreats, though who will peel the grapes? I never retreat from writers. I shall publish them on the beaches; I shall publish them on the landing grounds; I shall publish them, um, in a lotta other places until someone makes me stop. But, like, that link to your article on retreats is a real live get something cool right now for free link, huh? Well, then, I got the good stuff already. The big book is just gravy. I wonder if “groovy” was really just stoner for “gravy” ? I know I’m pretty, but it’s nice to hear it once in a while. May I add this as a source on the http://www.squidoo.com/get-published lens? Pat, sure. I presume you want to enter the contest to win too, right? I think I’m getting in under the wire. I love the idea of “free”. However, we all know there is really nothing free in life – there will be a catch, right? You can tell me, really. Bettsy, the catch is that I will ship you the book, but only a page at a time. But that means you’ll be much more excited about your daily mail delivery. Yay for giveaways and congrats on your article being included. I look forward to exploring more of your site, now that I found it through G+. Hey Laura, thanks muchly. And G+ does seem like a great resource—too good of a resource in fact, because I’ve been spending too much time there reading good stuff in people’s posts. Hey, I’m your sister — I deserve a chance for something free from you…finally! Plus I posted it on my FB page. Oh no, no way you’re fooling me with that “I’m your sister” comment. The last time I believed that I ended up in a car trunk with my mouth duct-taped. You can’t fool me. By the way, I’m your sister, too. Ah yes, Sister Canfield. Well do I remember that stern, mustachioed nun in her no-nonsense habit. Praise be, Sister! I may not be in the reckoning but I don’t mind commenting because I was thinking about wanting to have a book on word usage by you. Hey, Tom, if Rahul’s going to turn this into a voting scenario, hang on while I dust off my scripting skills. Imagine all the imaginary traffic I could drive to this here blog. Rahul, I can’t give an extra vote to Rick or Joel, because that would be jiggering the vote, and I am scrupulous beyond belief. (Well, for this contest, at least.) And also, since Joel’s my sister, that also skews wrong. Or is just plain wrong anyway. I wish we could send the book overseas, but it’s out of my hands anyway—it’s a promo from F&W Media and they’re sending out the book. But thanks for chiming in! I skew, you skew, we all skew for . . . wait; what were we talking about? Well, this “will he cheat?” question has been answered: NO! The winner of the drawing, as a literally paper-slip-pulled-from-hat affair by the lovely and talented Alice, is LAURA! And since I only know Laura from writerly doings on Google+, I’m innocent of subterfuge. But stay tuned for later giveaways of bags of sighs, stuck-on-red traffic signals and long stretches of wondering where you left that chili dog. Laura, glad you won the hat trick. I put a little blurb about your site on my latest post, so I hope you get some visitors. Thanks for playing! Here’s my comment. My comment. I find the guide potentially useful. Look forward to receiving it. Will it come by mail, or email? Roger, thanks for the comment comment, but the contest ended long ago. May you get the guide you want in times to come.